“The members of the Ramapo College film department (most notably professors Scott, Weinstock, Addington and Bressler) not only have encouraged my creativity throughout the years, but they also inspired it. 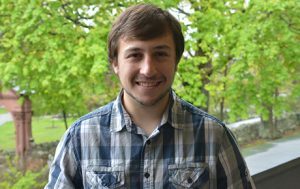 As I continue to grow as a filmmaker, I will always hold their opinions with the highest regard, and I strive to make them proud with each future project.” – Anthony Scalia ’16 is a Communication Arts major with a concentration on Digital Filmmaking. While at Ramapo, Anthony had internships with Z100: Elvis Duran and the Morning Show (Summer 2015) and PBS: American Masters (Spring 2016) and he studied abroad in Florence, Italy during the Fall of 2014. Anthony has received the following awards: Best of the Fest at Media Collision 2016 for “Stake-Out”; Best Short Documentary at Media Collision 2016 for “Jimmy Scalia: An Honest Portrait”; Winner of Best Fiction Film at N.J. Filmmakers of Tomorrow 2015 and Media Collision 2015 for “Parallel Parking”; Second Prize Winner at ProjectFX film festival for “Jimmy Scalia: An Honest Portrait”; and Best Short Documentary at Media Collision 2014 for “Backyard Treasure.” Anthony also received the Outstanding Academic Achievement award for Digital Filmmaking at Ramapo in 2016.